In the "Full Name:" field, type Your Name. In the "Email Address:" field, type Your Email Address. 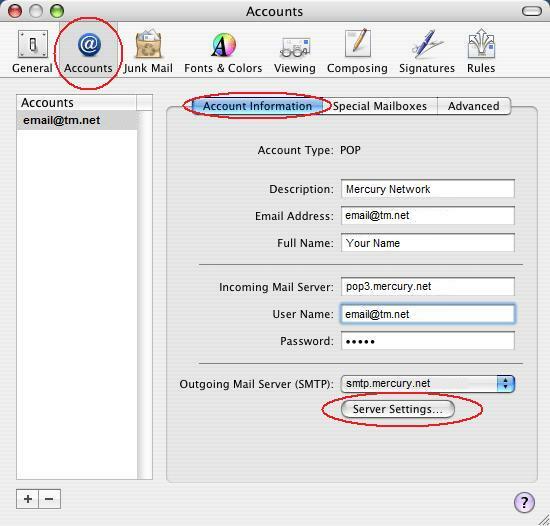 In the "Incoming Mail Server:" field, type in "mail.mercury.net". Click the arrow box on the "Account Type:" pop-up list and choose "POP". In the "Password:" field, type Your Email Password. 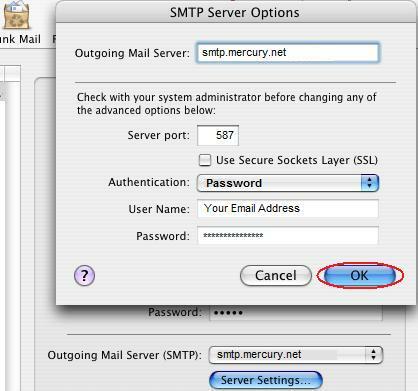 In the "Outgoing Mail Server (SMTP):" field, type in "mail.mercury.net". Click the "No" button, unless you want to import email from another mail program. The Welcome dialog box will appear. Make sure you have the "Accounts Icon" selected. You're presented with a window which contains three tabs, "Account Information", "Special Mailboxes", and "Advanced". First, let's look at the "Account Information" tab. "Description:" can be whatever you like, but it is recommended that you use "Mercury Network". "Email Address:" should be Your Email Address. "Full Name:" can be Your Name. "Incoming Mail Server:" should be "mail.mercury.net". "User Name:" should be Your Email Address. "Password:" should be Your Email Address Password. Click the "Server Settings..." button. 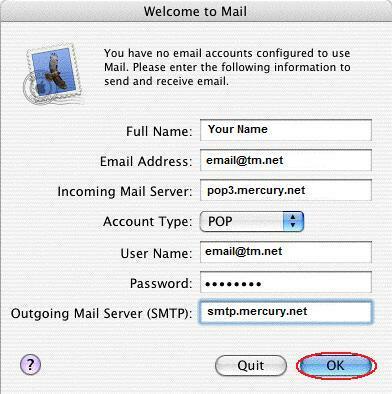 The "Outgoing Mail Server:" should be "mail.mercury.net". The "Server port:" should be "587". Change "Authentication:" to "Password". That's it! Press "OK" and close the Account window. 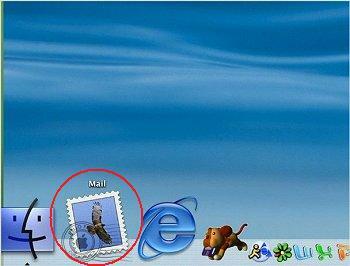 You are ready to use Mail for OS X.